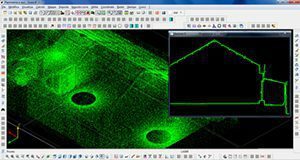 Measurements taken with laser scanner have the particularity of being composed of massive amounts of defined points. With Strato ® you’ll have the ability to handle more than 2 billion of three-dimensional points. You can also configure any ASCII format, defining their color (RGB) and the reflectance degree. The 3d points acquisition is performed in a rapid and direct way, with planimetric representation and in any three-dimensional view. Specific functions allow regeneration in a very short time, if you consider the large data amount. The points clouds obtained with laser scanner may have different applications.